So What Is the Cost of Living in Los Angeles, Anyway? What’s the cost of living in Los Angeles? Whether you’re moving here for the first time or you’re native born and want to know how much it’s going to cost to stay, people are always pondering this question. Ok, well, where to start? The logical place seems like examining the line item that’s going to take up the majority of your expense sheet: housing. Now, L.A. is known for its signature sprawling landscape, a landscape of absolute diversity, from its most beautiful peaks to its most unsightly corners. From Beverly Hills to Silver Lake to South-Central, it can be difficult to generalize and reconcile the city’s many upper-class millionaires with its many more lower-class immigrants, and no where is this more striking than in the housing market. The city of angels is the second largest rental market in the country (behind New York), so if you’re a newcomer to the area and are looking to see just how far your dollar will go in L.A., my advice would be to get familiar with its many many neighborhoods, and narrow it way down. 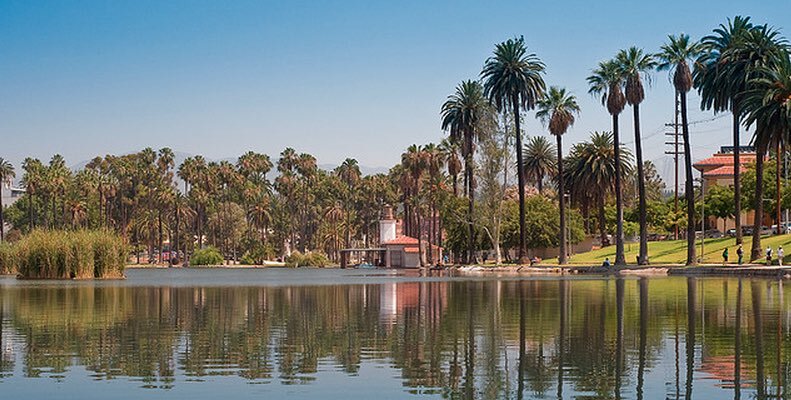 And bad news for those aspiring to (or already do) call our city home, L.A. is one of the most expensive cities in America to live… but there are some silver linings if you know where to look! Traversing the cost of living in Los Angeles can be disorienting, so we’ve provided a few pointers and resources to help you navigate this wonderfully peculiar city we call home. Ultimately, we hope this post provides on a primer on answering the question ‘What is the cost of living in Los Angeles’ though truthfully the answer is going to be a big, fat ‘it depends’ for the vast majority of folks. First things first. With cost of living we are referring to the income needed to sustain a certain level of living; it’s a theoretical index that takes into account things like housing, food, taxes, health care, etc. Here is a very user-friendly rundown (provided by areavibes) that has L.A.’s cost of living at 40.9% greater than the national average. For the statistically inclined, the nice folks at Numbeo have you covered. This is your one stop shop for all your cost of living questions, with hard numbers and extensive breakdowns, down to the cost of a can of Coke! And their rent index gives you an idea of how L.A. fares against other cities worldwide. The biggest cost of living expense for people is housing, so they say to always abide by the 30 percent threshold when making a rental budget. Though in Los Angeles, achieving this threshold is easier said than done. For example, if you have your sights set on a 1 bedroom apartment that costs $1300 a month, you should be making around $4,350 a month/$52,200 a year to properly afford the apartment (according to the 30% rule). And that income level is after taxes, so theoretically, you’d need to making north of $70,000 to comfortably afford. I guess the good news is you can always get a roommate…? Another recent study done at Harvard University in 2014 found that based on the level of households spending above threshold, L.A. has the worst housing situation in the country. Now there are a few schools of thought as to why Angelenos are forced to live beyond their means, but a popular assessment is a lack of housing options (i.e. we need more construction), and more specifically a need for affordable housing units. The popular apartment search site RadPad put out a list a short while back (Sept. 2013) of the cheapest and most expensive neighborhoods to rent in L.A., and the numbers largely hold up today. Remember, living in L.A. can be expensive, but it also depends are where you’re looking. 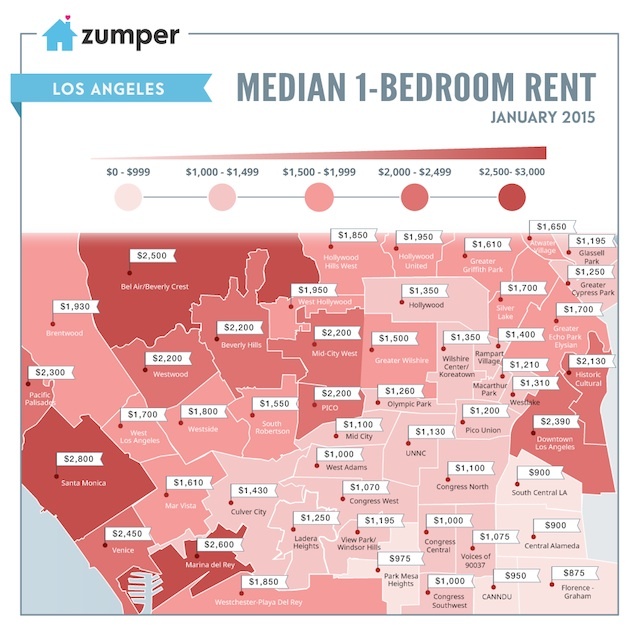 Additionally, zumper.com released some research just this past January which shows the median rents for 1-bedrooms across Los Angeles (see map above). According to the latest data, among the priciest 1 bedroom apartment medians are: Bel Air ($2,500/month), Westwood ($2,200/month), Marina del Rey ($2,600/month), Santa Monica ($2,800/month), and Pacific Palisades ($2,300/month). Long gone are the days of Jim Morrison living on the cheap in and around inexpensive party houses near the Venice Boardwalk (unless you live somewhere with rent control), as the Westside is now the creme de la creme of housing in L.A.
On the flipside, the some of the most affordable neighborhoods are South Central ($900/month), Koreatown ($1,350/month), Glassell Park ($1,195/month) and Mid-City ($1,110/month). I’ve also found Zillow to be a tremendous resource for researching neighborhood costs, especially for would-be homeowners. Their research has the median L.A. home value at $529,400. But a closer look brings the neighborhood disparities to life. Santa Monica’s median home value is $1,132,900, but head to the east side in Highland Park and the median is $508,700. And if we head south to Inglewood, houses drop to $379,700. So you get the picture. Residents of all those neighborhoods can rightfully call themselves Angelenos, yet are writing very different mortgage checks. It’s true that this is the case in every city, that its cost ebb and flows based on the neighborhood, but it’s a truth that really defines the Los Angeles housing landscape. Generally speaking, the further East or South you go, the more affordable the cost of housing is in Los Angeles. This is also true of heading North over the hill to the land Tom Petty sang about, The Valley, where a lot of people find more affordable housing by extending their commute just a little further. If you’ve made the decision to relocate to Los Angeles, chances are you’ve made peace with the car-centric lifestyle that it comes with. So perhaps heading to Van Nuys for the cheaper rents and taking the 405 to your job on the Westside is more your thing. 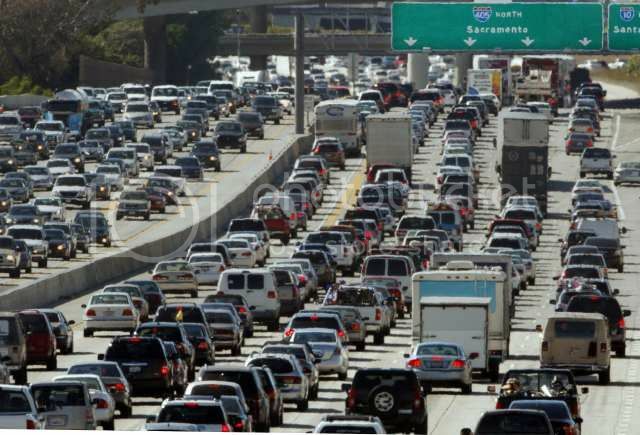 Keep in mind though that the 405 is literally the #1 worst freeway. Like, ever. No, really. Unfortunately, there’s no hard answer to the question posed at the beginning of this post. The best we can do is a qualified “it depends” but hopefully what we’ve written above provides a nice primer for future research depending on what your particular situation is. On the one hand, t’s true that the cost of my 500 square foot apartment in Miracle Mile could get me some serious space in Cleveland. But all 4 million of us can’t be wrong, right? Most of us spend half our paychecks to enjoy that year-round sunshine, and just can’t seem to help ourselves. No matter what corner of it we need to overpay for. Reality check: yes, L.A. is expensive. But for many people it’s also worth it. And the only person who can answer that question is you! What’s your experience trying to make it in L.A. while dealing with the cost of living? Let us know in the comments below!